Massachusetts Rep. Paul Heroux will spend eight days in the Hermit Kingdom—assuming he can get in. August is a month when American politics, never an exemplar of productivity, truly hits its summer lull. Richard Haas notes that while the Central Intelligence Agency was predicting that an Iraqi invasion of Kuwait was imminent by August 1, 1990, “it being August, many of the most senior people were away, escaping Washington’s notorious heat and humidity.” Even the U.S. Ambassador to Iraq was apparently not in the country. Over on Capitol Hill, the Congress adjourns for the month, as do many of its state counterparts. Most of the legislators return to their districts to pander for votes meet with their constituencies at various town halls and public forums. But one state representative will be spending part of his August far away from home. State Representative Rep. Paul Heroux, a first-term Democrat in the Massachusetts legislature representing Attleboro, a city 39 miles outside Boston, intends to spend eights days starting on August 12 in the Democratic People’s Republic of Korea, otherwise known as North Korea. No, he won’t be a special presidential envoy traveling to the Hermit Kingdom to lobby North Korean leaders to free an American hostage. This may seem odd to some. At a time when even many in the U.S. Congress exhibit alarming ignorance toward international affairs, the state representative who takes an active interest in foreign affairs is rare indeed. But Rep. Heroux is not your average state representative. For one, he’s well-traveled, having been all around Europe and the Middle East, including living in Saudi Arabia where he taught English. He’s also extremely knowledge in international relations, and holds an MA in the subject from the London School of Economics, as well as an MA in public administration from Harvard’s Kennedy School of Government (KSG), where he studied under such notable professors as Joseph Nye, R. Nicholas Burns, and Graham Allison. In fact, Rep. Heroux’s path to North Korea runs through the KSG. Students at the school often set up what they call TREKs to various places, ranging from Palestine to high-security prisons inside the United States, which Heroux tells me was the location of the TREK he set up while studying at KSG (along with international relations, he’s also very interested in criminal justice and holds a third MA in criminology from the University of Pennsylvania). The TREKs are not sponsored by the school, but usually attendees have ties to KSG. This year one of Rep. Heroux’s acquaintances from KSG told him they were planning at trip to North Korea and asked if he’d like to join. Having decided to put off his trip to Iran until next year, Heroux readily agreed, quickly purchasing his plane ticket to China out of his own wallet. There’s no guarantee he’ll be allowed in the country. The individuals attending the trip were required to fill out a background questionnaire, which they submitted to North Korean authorities through their Chinese travel agent. Rep. Heroux’s occupation as an American state representative is likely to raise some eyebrows in Pyongyang. Perhaps more concerning to North Korean leaders will be Rep. Heroux’s position as a columnist for The Huffington Post, where he writes on a multitude of subjects including Iran. If Rep. Heroux’s makes it into the country he and his travel companions will follow a strict itinerary planned out by North Korean authorities. This will include visits to various universities, museums, and the USS Pueblo, which Heroux points tells The Diplomat is kind of a “stick in our eye” (The Diplomat spoke with Rep. Heroux before Pyongyang re-unveiled the USS Pueblo over the weekend). 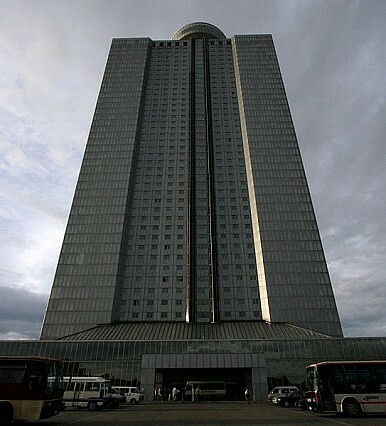 The KSG group will stay at the Yanggakdo International Hotel (pictured above), a 47-story building in Pyongyang that is located on an island in the Taedong River (Patrick Chovanec describes his time at the hotel here). Given his obvious passion and knowledge of foreign affairs—as well as his state’s history of providing some of America’s top diplomats, including the current secretary of state—The Diplomat can’t help but ask if Rep. Heroux will eventually seek federal office, where he can play a greater role in shaping the country’s foreign policy. Noting that he has only been in his current position for 7 months, Heroux responds that he “would have to leave that up to the people.” Still, he admits that while he has taken a liking to the state issues he currently deals in, his background is in foreign affairs and international relations. You can follow Rep. Heroux on Twitter @PaulHeroux.